Pillar to Post: FISCAL CLIFF SOLUTION: ONE GRATEFUL VOTER SAYS THANKS. FISCAL CLIFF SOLUTION: ONE GRATEFUL VOTER SAYS THANKS. 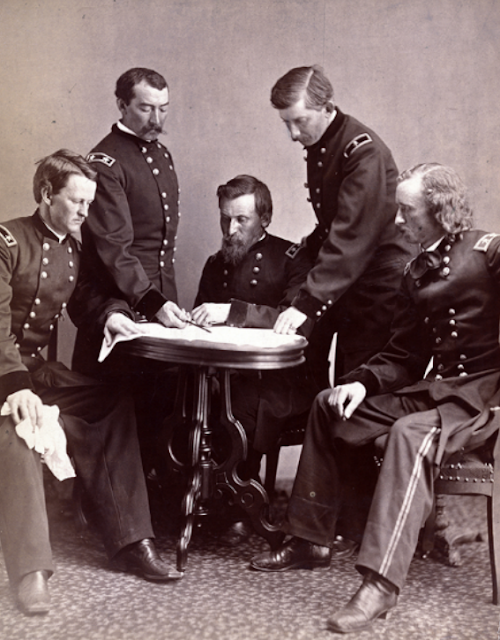 Sheridan’s command—The photo by civil war photographer Alexander Gardner (1881-1882 was taken on January 2, 1865. It shows the Union generals under the command of Philip Henry Sheridan (1831-1888). [pictured left to right]: Generals Wesley Merritt (183401910; Sheridan; George Crook (1828-1890); James W. Forsyth (1835-1906); and George A. Custer (1839-1876). Library of Congress photo. A STEP UP--The House and the Senate were able to cobble together legislation that passed in time to avoid the recent “fiscal cliff.” Amid plenty of angst coming from both sides, a compromise was reached. Our legislators showed a streak of bullheadness, but in the end they couldn’t but help noticing the American people staring keenly at how they voted. Public scrutiny is often far more effective than pearls from lobbyists. And, not since the Korean War were members of the House in session over the New Year’s holiday. My one vote is grateful for the compromise. I look at both parties today with a more favorable light (albeit a dim light emitting from the basement). The above photo today will remind us of a time when our legislators were so unwilling to bend that a civil war broke out. Let’s encourage all our elected representatives to view the fiscal cliff compromise as a colorless step forward toward constructive compromises in the future. Our government isn’t set up to have everyone in office agree with each other. Here’s a link where house and senate emails can be found. A note of thanks might be appreciated today more than most.